Every now and then, you reach that point. The place has become a free-for-all, there is crap everywhere. Loose ends and important papers co-mingle with no rhyme or reason. If you let it go any longer you’ll be overrun like a post office on tax day. It’s time to roll your sleeves up, jump in there and start separating and sorting. For the sake of imminent easy storage, keep all related items together and divide them by desired categories. Once that’s done, let’s take a look at a few innovative and fun ways to pack your stuff seemingly out of sight. Instead of flat panels behind your shaker cabinet frames, why not install thin chalkboard slabs instead? Sounds a bit impractical? 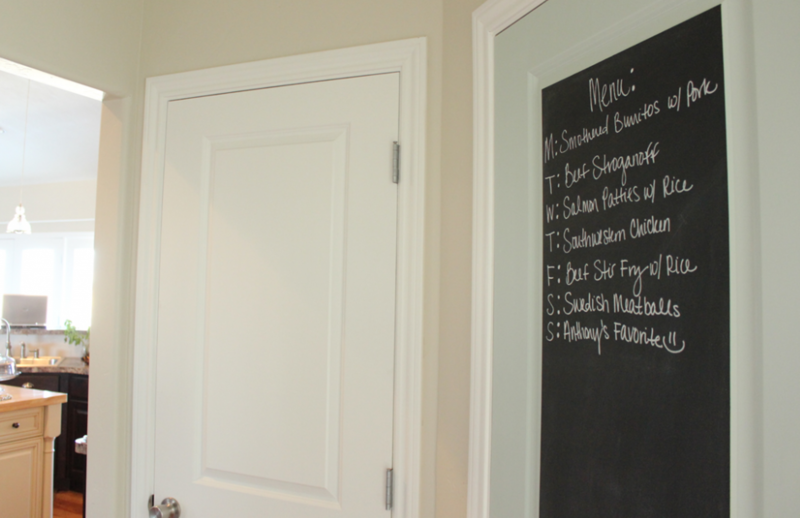 That’s okay, you can actually PAINT your cabinet doors with Chalkboard Paint, producing a surface that you can write on just like the real deal! By doing so, you will be able to label your cabinet doors and list the contents within. What’s more, the text is just as easy to erase and change as you rotate stuff in and out. Is there a member of the family that would benefit from the use of an assigned personal bin? Of course there is! Some may even use two! O.K. then, keep the household running smoothly by assigning one or more of these buckets to each individual of the home (don’t forget the dog!) by labeling their name on it. Keep the bins together and as close to the front door as possible. Your housemates can toss their keys in with adequate space to also place their hats, scarves, magazines and other random stuff they typically throw aside carelessly. 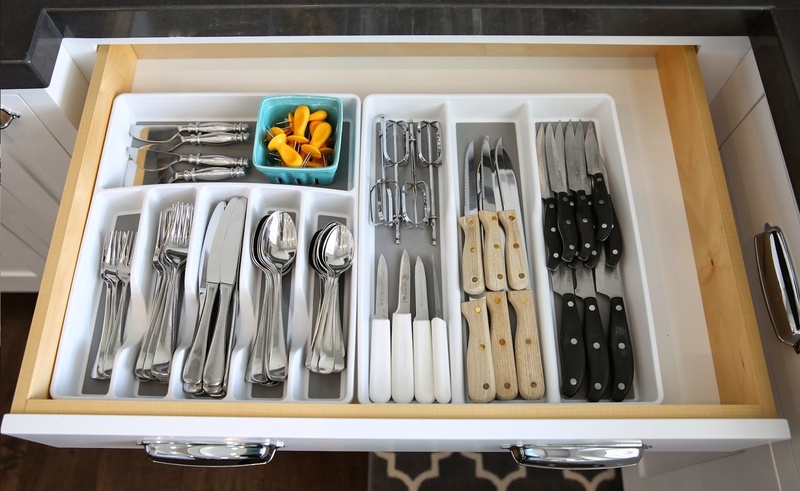 By now you’re aware that you can get sturdy plastic ware in just about any configuration. They come equipped with heavy duty lids that snap perfectly into place. Write the name of the contents onto blank self-adhesive labels, and then affix the labels onto the jars. 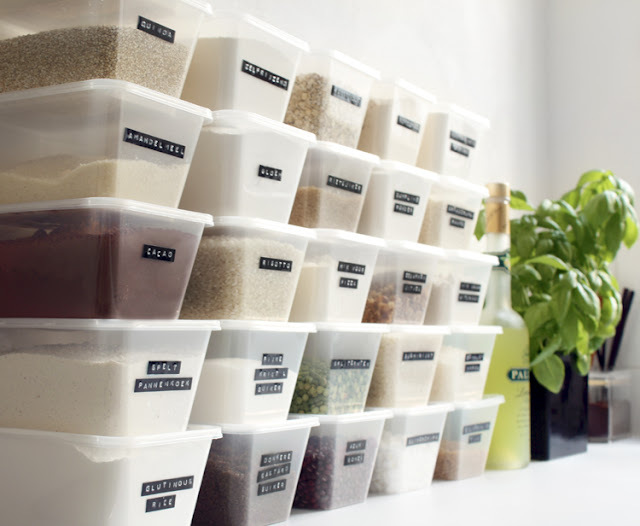 Line the small tubs in a drawer with the labels face up – all it takes is a pull, a glance downward and you have just made an efficient beast out of the plastic containers. Have a small closet that you’ve had little use for? Turn it into a room dedicated to storing your craft supplies. Fit it with shelving and labeled bins. You may also keep your projects on canvas and other mediums within. Set up a row of mason jars upon the top of the shelves and use them to store brushes and random smaller items. The visibility of the clear glass will make it easy for you to retrieve what you need when you need it. To aid with the aforementioned artistic endeavors – and to encourage young people to take them on, tidy up the coloring supplies that would otherwise be strewn about the home. 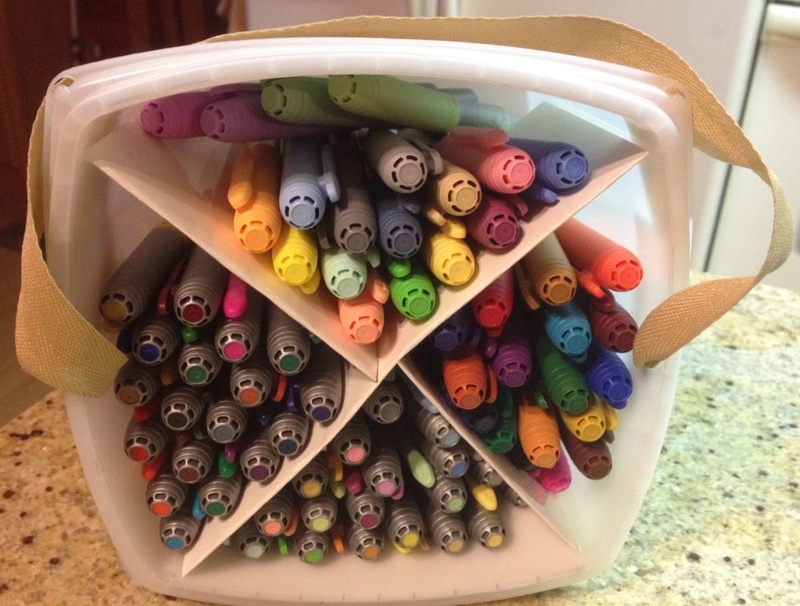 Use small buckets as art supply holders. Within, place a generous selection of commonly used items such as crayons, markers, and chalk. Install an attractive utility rail along the wall and hang them from it. Set them up low for easy reach and establish the location as the source of the art tools for the benefit of children so they may learn to know where things are and where to put them back. 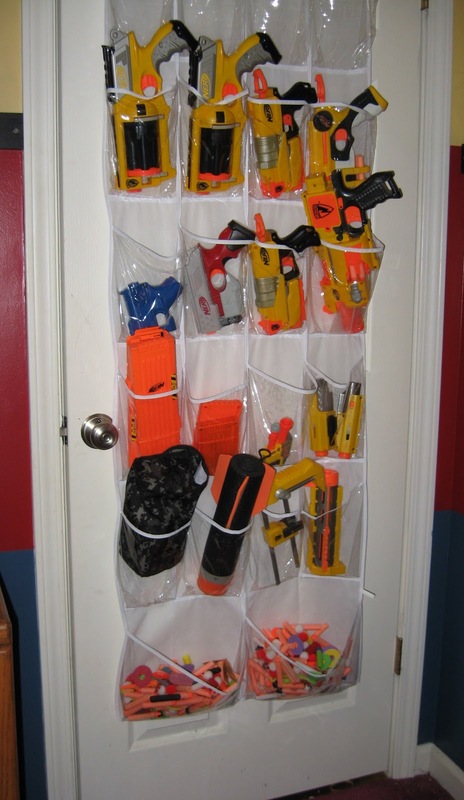 Another great idea that helps get our kids coordinated is the implementation of an adjustable organizer hung from the back of a door so they may continue to learn the habits of putting their own things away. For instance you could install a hook for a backpack, a rack for their shoes and a basket to be used exclusively for library books. That will become their go-to spot before and after school as they develop the habits of a positive routine. Meanwhile, there is a ton of papers large and small lying around, and you bring home more every day. There are maps, menus, post its, business cards, an array of paper goodies you don’t want to dispose of. The solution – a Postcard Rack the likes of which you used to see in a drugstore or a five and dime, a really neat solution if you can find one. It may take a little searching, but it’s worth it. It perfectly accommodates paper in all sizes while keeping them visible. 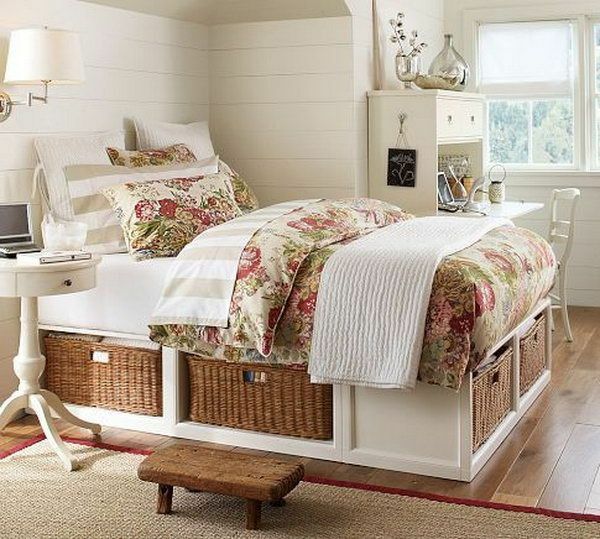 For that extra bit of storage space, find long but shallow baskets that can easily fit under couches or beds. You’ll be surprised how much stuff you’ll end up putting in them – everything from books to Blu-ray’s to video game boxes – instantly clearing up the room and de cluttering it drastically. You’re already buying family sized bags of individually wrapped snacks – you’ve got chips, candy, granola bars, crackers, nuts…. Save face from clumsiness and empty the contents into their own baskets. 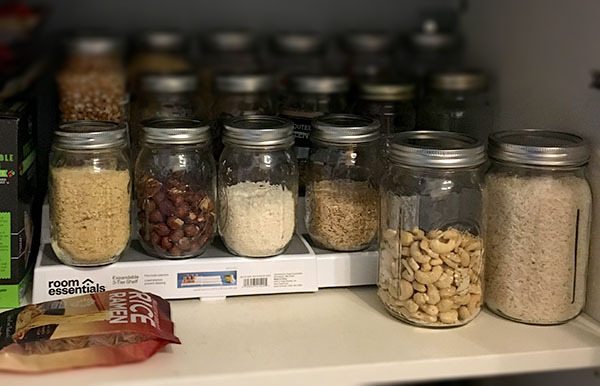 You could have one for sweets, one for healthy snacks, one for candy, etc… Then you can just open the pantry door to be granted instant and easy access! Another addition to the pantry, large glass jars that you may label. You can put just about anything in them – cereal, pasta, pretzels, coffee, etc… all side by side and easily accessible. No more tearing through the mess of random packages, it’s all labeled and it’s all right there. Streamlined routines thanks to organization!